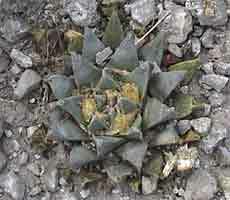 A. retusus 'scapharostroides' LRM259, An average size plant with some cattle damage. A. retusus 'scapharostroides' LRM259, in bud in early October. 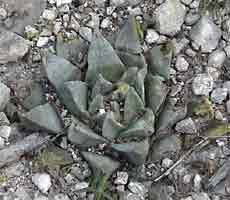 This plant is a very typical retusus of the ‘scapharostroides’ type, as found nearer to Rio Verde and at El Sauz. 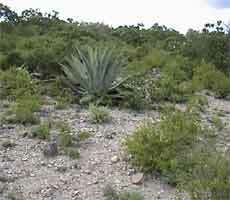 It grows on very gentle limestone slopes, mainly under low bushes, Very few other cacti were found in association with these plants, only the ubiquitous Opuntia sp. and an unidentified Coryphantha. The area is used for cattle grazing and many plants shown signs of hoof damage.